Keylogger, Keystroke Logger, Spytech, Keystroke Spy, Keystroke Recorder, Spy Software, Computer Monitoringter users are doing. Keystroke Spy can log every keystroke users type, record screenshots, and also alert you via mail when certain keywords are typed. Keystroke Spy is an extremely easy to use computer monitoring product. Keystroke Spy, while being able to log all keystrokes typed by users without them knowing, can also be set capture screenshots of all activities. 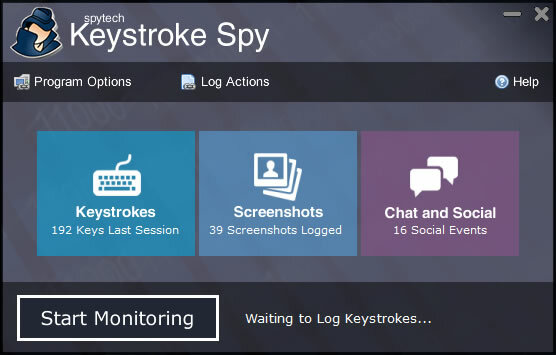 While allowing you to see who users are talking to, what websites they visit, emails they send, and more, Keystroke Spy can also be configured to email you logs, and alert you when certain words are typed - like names or addresses.Built around an easy to use graphical user interface, Keystroke Spy only takes a few moments to install and use. Key Features:Logs all Keystrokes Typed Captures Screenshots of All ActivitiesLogs Website VisitsLogs Applications Opened and ClosedLogs Chat Messages Sent Logs Email SentLogs PasswordsLogs Typed Documents Sends Activity Logs via EmailCan Log Specific Applications Typed Keyword Alerts Powerful Graphical Interface Disables Spyware DetectorsRuns in TOTAL STEALTH!